Convert accounts Minecraft statues inside the game. 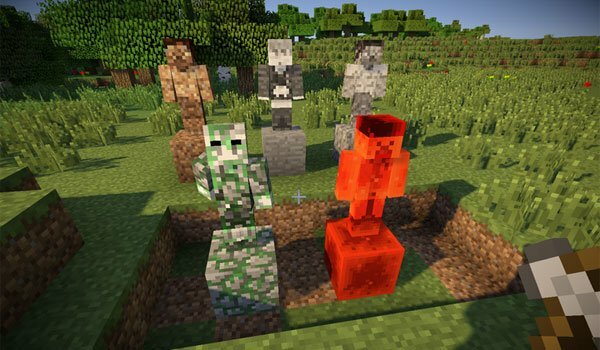 Statues Mod 1.6.4 is a really easy mod that lets you decorate your worlds, houses or buildings using statues that have the appearance with many of Minecraft players. The mod is responsible for reproducing the appearance of the skin of that account that assign. This is really easy, we just put two blocks vertically and use the “Hammer” mod tool that adds the right mouse click. Then, an interface will appear where you have to write the name of the Minecarft player or the account. You also have to fill in which position you want the statue to be placed. Besides this, the mod adds a display cabinet where you can keep the swords and show them as works of art. These cabinets can be opened. How to install Statues Mod for Minecraft 1.6.4? Statues with skins for all Minecraft players!